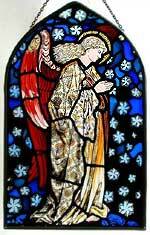 The 'Praying Angel' is a supremely successful inspirational work by William Morris, leader of the Arts and Crafts movement of the mid-1800s. It is one of a series of six panels, set against celestial skies. A great feeling of peace and devotion is given off by this wonderful composition. The original church window is at Cattistock Church, in Dorset.